"Preserving the beauty of our aboriginal homelands "
The mission of EMO is to promote environmental stewardship through proactive approaches and solutions by sustaining our natural resources, protecting public safety, and providing public awareness through education, collaboration and policy. EMO was established in 1996 by Alan Spoonhunter, and has served the Bishop Paiute reservation, and neighboring communities for over 2 decades. Alan Spoonhunter (1949 - 2006) is remembered as a community leader who helped start many tribal programs, and we remember him as being generous with his time and thoughtful with his advice. We welcome you to browse the programs, activities, and services of the EMO using the tabs above. 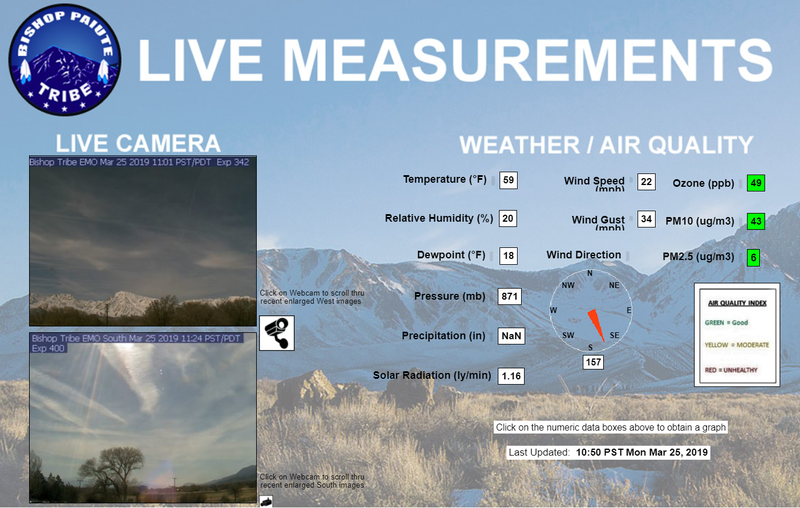 For real-time air quality and weather measurements at the monitoring station click on the image below.